Home fans in the bleachers and the Eastfield bench stood with fingers pointed in the air, waiting for the final rally to end. Brookhaven was returning a serve and the initial kill attempt was blocked, but the Bears quickly recovered and set up again. As the hitter went for the kill, Eastfield’s blockers again closed off the angle with outstretched hands and blocked the ball back into the Bear’s court to win the match. Eastfield coach Brandon Crisp said he’s proud of the girls for persevering and pushing through the tournament. 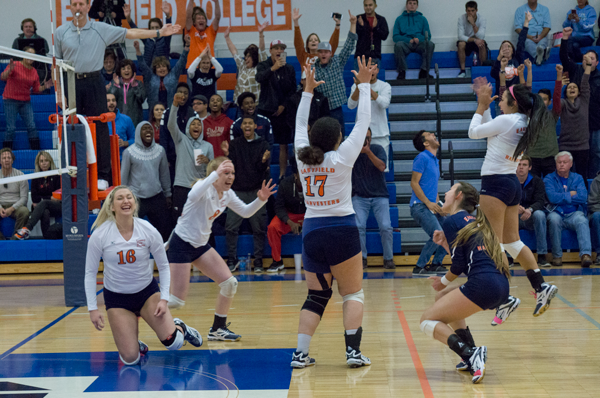 Eastfield swept Brookhaven 3-0 (26-24, 25-9, 25-16) today, winning the Metro Athletic Conference tournament and booking their place at the national tournament in Rochester, Minnesota Nov. 10-11. Middle blocker Payton Costlow, who finished with 11 kills and 5 digs, said she was overjoyed about going back to nationals. The first set was evenly contested between the Bears and Harvesters, with neither team gaining more than a 3-point advantage. With Eastfield leading 24-23, Brookhaven tied the set following a long and hard-fought rally. The home team persisted and took the next two points to win the set. Outside hitter Keishla Reyes, who had six kills and three digs, started despite suffering a groin injury in the previous game, which Reyes said surprised the Bears. The second set started as closely as the first, but the Harvesters drew points on some bad dig attempts by Brookhaven to edge them 9-5. From there, the team won 16 points from 20 to take a 2-0 advantage. In the third set, the Bears again challenged the tournament hosts initially, but a couple of blocks by Chloe Hope paved the way for the Harvesters to win seven consecutive points and lead 11-5. Eastfield kept the lead but Brookhaven eventually cut it to just four points at 18-14. But in the final rallies, the Harvesters took seven from nine points to win the set. The team overcame a revitalized Cedar Valley team in the semifinals yesterday, beating them 3-2 in a highly contested match. Costlow said the expectation is to top last year’s third place finish. “I expect us to be in that championship game, fighting for first place,” she said.